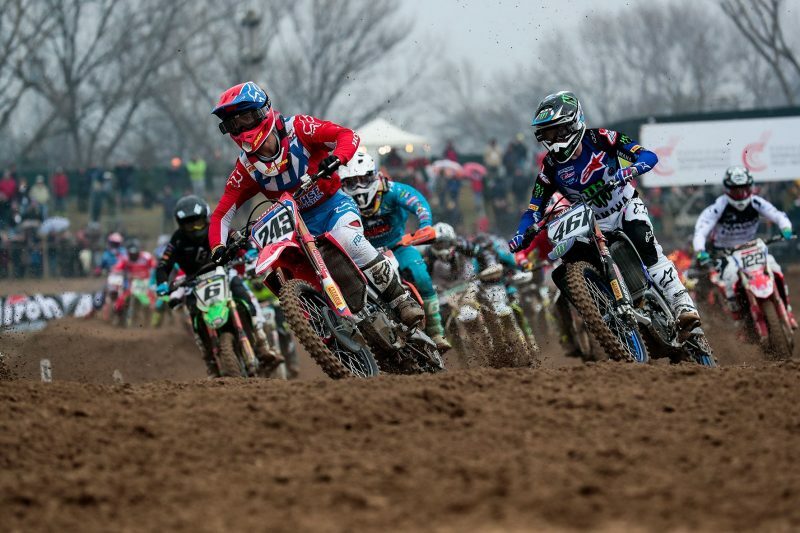 Team HRC’s Tim Gajser won the final round of the MX1 championship at the sandy track of Mantova, in cold conditions in northern Italy. Leading from the beginning, the #243 CRF450RW gradually pulled away from the field, to win by just under 10 seconds, securing third place in the championship in the process. In the superfinal afterwards, a combined 450 and 250 event, Gajser then posted the fastest lap of the race as he made his way back to fourth after an early crash left him almost dead last. With two second place finishes in the previous two superfinals, this result secured the Slovenian second place in this championship and a good boost of confidence for when the MXGP championship starts on the March 2/3 in Argentina. For Calvin Vlaanderen, a second place finish at the second round in Ottobiano was his standout performance, along with a sixth place in the resulting superfinal against the 450s. While not completely satisfied with his results, the young rider from Cape Town is happy with the progress they have made over the winter and is glad to have done some races before the first round of the MX2 championship. Brian Bogers is also happy to back in a race environment after missing so much of the 2018 season. The Dutch rider knows it might take a while to get back up to race pace in this highly competitive MXGP class, but believes that these Italian Championships events have given him a better idea of what needs to be done in order to get his #189 machine challenging at the sharp end of the field. With just under three weeks until the first round of the 2019 MXGP Championships, Team HRC will continue to prepare and make sure all three riders are ready for the gate drop at the beautiful Villa La Angostura track in Patagonia-Argentina. Tim Gajser 243 Overall I’m quite happy with how these first few races of the year turned out. Riola was okay, Ottobiano was better and then Mantova was even better than that, so it was good to see step by step improvements each race. I was feeling better each time I rode my Honda CRF450RW and that is important and it makes me look forward even more to Argentina, to start finally start the season. I am ready to give my best! Brian Bogers 189 For me the Italian Championship didn’t go so smoothly, but at least we know what needs to be worked on to get better. Right now though, I’m just happy to be back racing and to be back with the team at the races, that’s a really a nice feeling. We are going to keep building from here and we will see what happens when the GP’s start at the beginning of March. Calvin Vlaanderen 10 The Italian Championship went reasonably well. It was nice to get behind the gate again and get some race time. I think we all miss that and miss the nerves and excitement of being behind the gate so it was nice to have that out of the way before the first round of the world championships. Riola didn’t go so well, but in Ottobiano I got second in MX2 and then sixth in the superfinal against the 450s. I still wasn’t feeling like I was riding to my true potential though so we did some more testing before this weekend in Mantova and while I didn’t have the best of luck there, it was good experience and good race time going into Argentina. Marcus Pereira de Freitas HRC General Manager – MXGP I am very happy with how the Italian Championship went for Team HRC. All three riders got some valuable race time and some all-important gate drops, in preparation for the first round of the MXGPs, which start in a couple of weeks. Tim showed really good speed in all three rounds and it was great to see him rewarded with a moto win in the final MX1 race. Calvin and Brian both had some bad luck in the races but Calvin’s second place at Ottobiano showed he already has the speed in MX2, while it was important for Brian to get that race feeling back, after missing so much of 2018. It has been a good few weeks of training and racing and I am extremely excited to get down to Argentina for the first round! Next → Next post: 2019 MXGP of Turkey Tickets Available Now!